Effective January 1, 2009, St. Paul Parish will no longer be using the Debit/Credit card system that has been in effect for the past two and a half years. You can make your financial contributions in cash or by check on a weekly or monthly basis. If you are not yet using the envelop system please consider beginning using them. Thank you very much for your continued generosity. Grades 4 – 10 +, Generation of Faith This program is designed for both parents and children. Parents who have children in grades 4 - 10 are asked to attend these monthly sessions. The adult session gives them an opportunity to refresh their memory on important matters of the faith as well as giving them the chance to share with other adults on pertinent issues of faith. 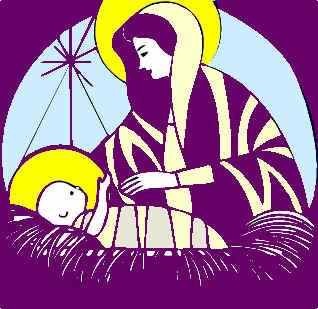 The next class for parents and children in this program will be January 18, 2009 at St. Peter Parish in Auburn. All GoF classes are held on Sundays from 4 – 6 pm. Question for Adults: Do I long for Christ to be part of my life with the intensity and fidelity of Simeon and Anna? The stories of Simeon and Anna as told in the scriptures are sketchy at best. There is just enough information to tell us that they are old and have spent much of their lives in the service of the temple. Their commitment to their faith in God seems to be the overwhelming focus of their lives. Can we imagine ourselves doing the same? Are we serious about our commitment to the God who created us and loves us? The Christmas season is a beautiful time to reflect on this idea. Where exactly do we stand in relation to this question? Question for Children? Do I remember that I was born because God has a special plan for me, just as he did for the baby Jesus? Not only do we not remember that we were born with a unique plan, there are many people who never even realize this to be a fact. Teaching children that they have a unique purpose in life is crucial to their happiness. We have come a long on the road to teaching children that they are unique beings but we have not always been as good as instilling the concept that God has a unique plan for each and every one of us. Talking to your child about this might be the best Christmas gift you can give them. Is Christmas the most important feast for Christians? Although Christmas is by far the more commercially promoted feast on the calendar, it is only the second most important liturgical feast. The number one feast is Easter when we celebrate the Resurrection of our Lord. Christmas is probably the most elaborately decorated because it falls in the winter time thus the lights serve to light our physical darkness while it serve to symbolize the fact that Christ came to light our world. Also, gift giving has grown mostly due to our financial means and, as humans, we feel good about giving to others. Of course, we realize that commercialism has played a major part in promoting the fanfare of gifts. Food Pantry for January This month our pantry shelves continue to be in need of Tuna, Cereal, Peanut Butter, Jelly, Spaghetti Sauce, and any kind of Soup except Ramen. We are also always in need of juices and instant milk. Thank you very much for all you do for those less fortunate. Adjusting our Habits. . . Over the next few months we, as a parish community, will make an effort to adjust some of the poor habits many, if not all of us have developed over the past few months or even years. This month we will take special note to eliminate gum chewing in church. The main reason that gum chewing should not exist in church is that it is very irreverent to receive Communion when we have gum in our mouth. Our belief that we are receiving the Body of Christ is another way of saying that God himself is coming to us through the reception of the sacred host. We should not have anything in our mouths at the time of Communion. We will be placing a receptacle in the entrances of the church so that you can throw your gum away as you enter the church. We will also focus on eliminating the distraction of cell phones. We have noticed that some people are beginning to text message during Mass. This is inappropriate for several reasons. So, this coming week, please shut off your cell phones before coming into church. Thank you for your cooperation. Looking for Used Baby Clothes: If you have young children that have outgrown their clothes and the clothes are still in good condition, Birthright of NH would greatly benefit from their use. There are many young mothers who need a great deal of help in this line. If you have clothes anywhere within the size range of Newborn to 4T, please bring them to the church and we will deliver them. Thank you so much. The Thomas More college wishes seniors a Merry Christmas and good luck with upcoming college applications. Thomas More is accepting applications for Fall 2009. Apply before Feb. 1 to waive the $25.00 application fee at www.thomasmorecollege.edu. Remember to take time and enjoy this blessed season. Please pray for the following people: Josephine Stout, Frank Huard, Betty Lintz, Cecile Gendron, Kimberly Mirolo, Rita Sullivan, Kathy Gauthier, Jean Swindler, Roger Plante, Joseph Gesel, Jacob Desrocher, Cindy Huard, Deborah McGovern, Ethel Thomas, Gordon Gladden and Carol Sheperd.